Livefyre, the software platform that embeds live commenting on websites, has secured $4.5 million in a new round of funding. The San Francisco-based company says it plans to use the money to hire more engineers and salespeople and expand its products. Livefyre is seeing solid growth at the moment: The company’s platform is now installed on more than 14,000 websites, from small-time bloggers to big publishers such as The Sun, Sugar Media, Talking Points Memo and MIT Tech Review. With the new funding serving as a Series B round, Livefyre, which has 28 staff, has raised a total of $5.3 million to date. All that money will come in handy, though, as Livefyre is up against some pretty stiff competition: Facebook. Lots of publishers are opting to use Facebook comments largely to cut down on spam and bullying. Since Facebook profiles are ostensibly tied in with users’ real identities, people are more likely to behave when they are providing feedback through Facebook comments. Meanwhile, Livefyre’s real strength is that it allows publishers who want to ultimately host the contents that are on their posts — satisfying the urge to “own their own content.” It’s a compelling argument for using the service, but not all publishers are as concerned with content ownership as they are with popularity. Facebook comments allow posts to become quite popular, if only because they tie into the world’s leading social network. 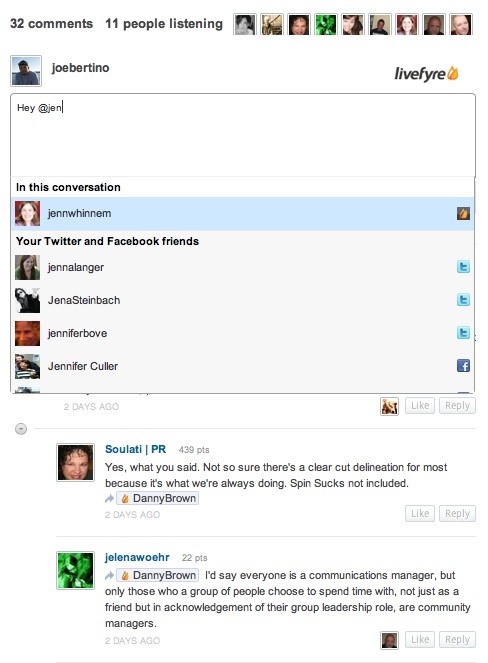 But Livefyre has a few social things up its sleeve as well. The company recently debuted SocialSync, a new feature that enables commenters to share directly with their friends on Facebook and Twitter and invite them to join in the conversation. SocialSync also allows publishers to automatically pull in comments from Twitter and Facebook that are relevant to their content pages in real time. The company has already scored an impressive number of clients, and the new funds and social capabilities could ensure that Livefyre sticks around for the long haul — and stand up against its big-name rival. Maybe with that money they’ll find a way to make it actually work compared to the disastrous implementation that’s out there now? Congrats to Livefyre on the new round – hopefully it will enable them to do lots of exciting things in this space. Livefyre rocks! Been using them for a few months and it’s a flat out great product. SocialSync is new and needs a few tweaks, but it’s working great so far. Disqus is a competitor, and there are a few others. I’m a little surprised they weren’t mentioned here. What about DISQUS? Isn’t DISQUS a competitor?